We looked at 712 Richards Street – the larger building – in an earlier post. It was developed in 1910 by E E Hewson, a Nova Scotia businessman, designed by Dalton and Eveleigh and built by Baynes and Horie. When it was built, and for over a decade after, there was a house to the south (shown in the earlier post). 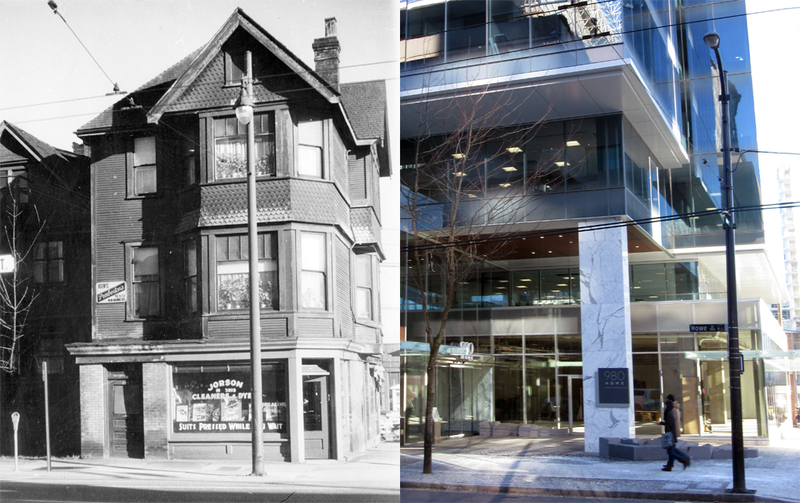 It was occupied by the Murchie family; John, who ran the Orient Tea Co, based initially (in Vancouver) on Cordova, and later on Pender Street (where Douglas and James Murchie were both clerks with the tea company). The company history says John Murchie immigrated to Canada from Scotland in 1894 and founded Murchie’s Tea & Coffee in New Westminster, BC. It also says that long before that, John had started his career in the tea industry with Melrose’s of Scotland, a prestigious tea import merchant in Britain. John was first shown in Vancouver selling tea on Cordova in 1896. In 1901 some of his family were working with him at that address, John was managing with Grant and John R Murchie both clerks. They were living on W 2nd and the Census that year shows John was aged 45, his wife Sarah was 34. The census return suggests a different early history than the Murchie’s website – John had arrived in Canada in 1879 and Sarah and their older children were shown being born in New Brunswick. That ties in with a John Murchie of the right age living in Bathurst, Gloucester, New Brunswick in 1881; a clerk living as a lodger in the Grant household. He was shown as being a Bible Christian; in 1901 he was described as Brethren. In 1901 the children were Grant, aged 17; John R, 15 and Catherine, 12 – they were all born in New Brunswick. Gertrude who was 11, Archibald, 9; James, 7; Helena, 4; Hedley, 3 and Nicolas 2 months were all born in BC. In 1911 all of the family were still at home, which was shown as 722 Richards. The clerk who recorded the family had horrible spidery handwriting, and some strange changes to the names. John’s wife is Annie, and their eldest daughter is shown as Chatrien. Nicolas is shown as Ninian, (and his birth certificate shows he was Nicolas Ninian Murchie) and there’s a final addition to the family; Douglas. From August 1923 the street directory showed the Murchie family living at 720 Richards, and the Tea Company having moved to 722. That suggested to us that the building was developed by John earlier that year, and indeed there was a building permit in March 1923 for F. T. Sherborne to build a $6,000 store/office for him. Mr. Sherborne was a building contractor with an office on Granville Street and a home on Nicola Street, and we assume he designed the building as no architect was listed. In 1928 the insurance map shows the tea company occupying the main floor with a dwelling above. By 1930 the family had moved to 714 Homer, but the tea company was still at 720 Richards. A decade later Sarah A Murchie, widow of John lived at 720 Homer with James (proprietor of Orient tea) and Gertrude. John R Murchie had a rival business, Eureka Tea, on Dunsmuir Street. The family were once again ‘living over the shop’ – Orient Tea was also based at 720 Homer. By 1950 James D Murchie was running Murchie’s Tea Co on Robson Street, But John D Murchie was shown running the Orient Tea Co on Homer. That year 722 Richards was home to The Steak House; in 1940 it had been Jordan’s Café. 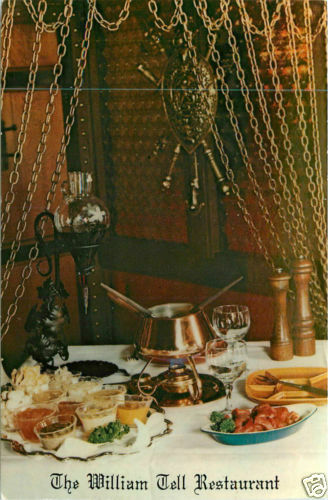 By 1981, as our image shows, 722 Richards had become the William Tell restaurant. The restaurant opened in 1964, run by Swiss-born Erwin Doebeli. The building was said to have been abandoned and mice-infested when he took it over, but became a success after initially struggling. In 2004 Doebeli reminisced with the Georgia Straight The first menu featured Prince Rupert shrimp cocktail or B.C. smoked salmon for a buck. “And, naturally, consommés, which is very European,” he says. Salad – then considered rabbit food – came with Roquefort or French dressing. You could have tournedos Rossini ($4.50, and someone claimed his prices were expensive) and pick Calona Crackling Rosé or real French Beaujolais off the wine list. Behind the scenes, tempers were uncorked too. Doebeli went through chefs like a hot knife through butter, 14 in the first eight months, until, he says, he became smart enough to realize that chefly pride needed to make its own mark on the menu. Today it’s a parking lot for a car hire company – waiting for the developer owner to finally take the plunge and build a commercial building that fits the Central Business District Zoning. We recently looked at this block further down the hill in 1974. Here’s an image shot in 1981 a bit further south. The building on the corner is, we suspect, quite a bit older than it appears. It’s addressed as 501 West Georgia, and dates back to 1908. This image shows it’s appearance has evolved quite a bit over the years, although the dimensions of the building remain consistent, so the frame may well be 108 years old. The buildings running north down the hill have remained remarkably unchanged for a 35 year interval. The back of the Bay’s parkade is here – although one day it will finally get redeveloped. Apparently underneath the observation tower of the Harbour Centre, Dunsmuir House (the former Dunsmuir Hotel) is also awaiting restoration and is in the meantime boarded up. It’s owned by the same owners as the parkade, and eventually almost all this block will be redeveloped. Today’s Salvation Army Citadel at Gore and East Hastings was called “as modern as tomorrow” when it opened in February, 1950. Today it could be more accurately described as “as tired as the day before yesterday”. It’s days may be numbered as the owner since 2001, Vancouver Coastal Heath, have no use for it, and recently BC Housing issued an Request For Proposals for a non-market housing design for the site. Mercer and Mercer designed the monumental building in a somewhat retro art deco style (twenty years after the height of that style, in 1950). When it was built there was an auditorium, a gym in the basement and a kitchen and offices. It wasn’t the first Salvation Army building on the site – that was the building shown here in this 1950 Walter Frost image. It opened in 1907, and it too boasted offices and a 600 seat auditorium. The hotel (the Hotel Welcome) behind on Gore was also run by the Salvation Army as a hostel for 100 men, with a library and other facilities. The press coverage of the day didn’t identify an architect, but the way that it had been designed with the experience of the Army in it’s work in other cities suggests it may have been the work of a Toronto architect, or a talented officer within the Army. There was also a basement ‘clean-up’ facility, where loggers could get a shower and a shave, and burn any rubbish (or verminous clothes) so that they could rejoin ‘civilized’ society and find a room in one of the many hotels in the area that catered to their needs through the winter season when logging and mining stopped. The auditorium had an arrangement that the Army’s Commissioner, from his Toronto office, thought worthy of replicating across the country. The chairs were arranged with their back legs in a trough that ran across the room, allowing them to remain in place to ensure the order the Army preferred, while allowing them to me manoeuvred singly when necessary. There is accommodation for fifty men in the Hotel Welcome, and a few emergency cots can be set up if the place is crowded. It usually is full. Instead of a dormitory system there are private bedrooms and single beds. Downstairs In the reception hall, where in pleasantly chintz – hung windows red geraniums bloom, there are many books on a big table, lots of comfortable chairs, pictures on the walls and a general air of homeliness that one can imagine must be very grateful to men who are at loose ends with life. A black cat purred comfortably in the lap of a man over in the window reading a well – thumbed copy of a History of the War. Captain Birchall and the janitor run the hotel, and when men stay there, waiting for jobs, as they often do, they too, “pitch in,” Captain Birchall says, and help keep house. “It’s more like a home than a hotel, I can tell you,” said a man with the Cockney accent. And three or four men sitting around listening to the rain splashing against the windows nodded approval. Across the street is the Salvation Army industrial store, where Captain Birchall spends part of his time when he is not finding work for men who need it, and doing other odd Jobs such, as writing out meal tickets and visiting the sick. When this image was taken in 1959, we think this house had looked something like this for fifty years, although it had been around a bit longer. In 1902 J Jenkins got Cornish and Cooper to design and build a house here for $1,600. In 1909 J Jenkinson spent $2,000 on alterations to the house, which were designed and built by E Cox. John Jenkinson has also carried out $300 of repairs to the house a few months earlier. We’re going out on a limb, and are suggesting that the clerk in 1902 got the name slightly wrong, and John Jenkinson owned the property the whole time. The 1903 street directory backs us up: John Jenkinson lived here, shown as an employee of the BC Electric Railway. The Archives have a set of family photographs, and a little of the family history. John Jenkinson is said to have emigrated from Lancashire, England to Vancouver in 1898. He worked as a meter reader for the B.C. Electric Railway Company. The family were shown in the 1911 Census: John (born in April 1871) was living here with his Danish wife Ellen, daughter Olga, aged 7 and a Danish lodger, Alma Anderson. It’s likely that in the 1901 census John was the boarder shown living with with James Ray, as there was an electrician with his name in the 1901 census. That John Jenkinson was shown born in July 1869, had arrived in Canada in 1897 and was already a Canadian citizen. The street directory shows John Jenkinson working for BC Electric living in rooms at 1025 Eveleigh St, and it shows James Kay, who worked at BC Electric as the owner of the property. While we don’t know whether he was born in April or June of 1869 or 1871, it seems likely to be the same person. The 1921 Census shows the family – including Olga and Alma, still living at 992 Howe. John is shows as aged 51, which suggests 1870 as a birth year. Alma was recorded as John’s sister-in-law, and both John and Ellen are shown as arriving in Canada in 1897. He earned $2,700 a year. We know Mr. Jenkinson stayed in the city for a log time, as Major Matthews, the City Archivist, interviewed him in 1933 when he was recorded as ‘In charge of the Meter Department, BC Electric’. We tracked down John and Ellen’s marriage – it was in Vancouver in 1902. John was shown born in Ulverston, (in Cumbia) England and was aged 32 and Ellen was from Copenhagen, Denmark and was two years younger. Her father was Anders Anderson, and her mother Marie. We haven’t found when they died, but Olga’s death was in 1980 in White Rock. By 1930 the Jenkinson’s had moved to West 15th Avenue. As far as we can tell it remained a house. In 1955 it was run as Rooms by Miss L Leeds, who had Mrs E Grimes and L W Fisher living in the two units. The addition of the store front seems to have been a year or two later. By 1968 the building had been replaced with a single storey Royal Bank building, (which you can remind yourself of on another of out blogs) in turn redeveloped last year with a 16 storey office building developed by Manulife and designed by CEI Architecture with Endall Elliot. The Winchester is another venerable West End apartment building. Perhaps not quite as venerable as a few of the buildings we’ve looked at nearby, but a very respectable 90 years old, and now with heritage status. It was designed by father and son team of Enoch and George Evans, originally from Walsall in England. They arrived in Canada in 1912, just as the development industry turned very sharply downwards. George went off to war a few years later, but returned to rejoin his father in a successful architectural practice that could turn out both traditional designs (like this) and more contemporary moderne buildings. Alliance Estates Ltd were the developer; the permit was issued in October 1925, and Fred Davies was the contractor. There’s no sign of a company called Alliance Estates in the street directory of the day, but there was an Alliance Finance Co, managed by W J Albutt – although some directory entries refer to W J Albert – who was also listed as the proprietor of the apartments in 1929. It looks as if the 1921 census found Mr. Albert living on the opposite side of this block of Jervis Street, an Englishman working in insurance, earning $1,080 a year and living with his English wife Winifred. He was recorded in the census as J W Albert – although the same home address, 909 Jervis, shows Walter J Albutt in the 1921 street directory – and in the 1911 Census he was also called that, although then his spouse was called Edith. In 1911 Mr. Albutt was a traveller. As Mr. Albutt is shown with his name spelled correctly intermittently from 1911 to 1929, we suspect all the references to ‘Albert’ are errors based on hearing the name and not checking the spelling. There were two possible builders: Frederick S Davies ran his contracting business from E 15th Avenue, while Frederick Davies ran his from his business address on West Hastings – we think he’s more likely to be the builder here. There’s nothing of note in the building’s history that we’ve discovered. The earliest residents were a cross-section of the part of Vancouver society who rented a new apartment in the late 1920s. A clerk in a real estate brokerage; the president of the Bowen Utilities Corporation; a wage inspector with the B C Government; a music teacher; a Hudson Bay salesman; a Romer Gowns saleswoman; John Damer of John Damer and Son, Wholesalers of Fine and Staple Footwear; managers, clerks and stenographers. The title of this image – taken in 1st January 1962, is “Small narrow one-storey house (ca 1900) at 722 Keefer Street”. It looks as if that’s not completely correct: there was a house here some time before the 1901 insurance map was published, although the 722 Keefer address appears for the first time in the street directory that year, listing the occupant as “Gray”. The year before the house looks as if it was standing, but addressed as 708(a) as the street had been renumbered, so there were two properties knows as 708, and no actual sequence on the block (708a came after 710, and before 720!). That year Henry Brown was living here, in 1898 “Wood” and “Hewton” were shown – only one was given a clearer identification: Frank W Hetwton, a baker. The City Archives have wonderful 1900s photographs titled “Franklin W. Hewton and others climb “The Ridge” on Mount Garibaldi” and “Franklin Walter Hewton overlooks mountains”. In 1896 George Wood, J Wood and Miss A C Brewster lived at 708 Keefer, and while Miss Brewster’s occupation wasn’t identified, J Wood was a joiner, while George was a master mariner. Either the street was renumbered again in 1895, or more likely that was when this house was built, as Captain George Wood lived at 724 Keefer that year. In 1902 the street numbering had settled down, and Captain William Summerville lived here. He commanded the S S Vulcan – a tug that was referenced a few times in the local press and towing logs on the Columbia River a few years later when the engine cylinder heads blew out. Clearly the Vulcan was a wooden boat – a little later the boat burned to the waterline, but was rebuilt – only to catch fire and burn out again. The captain was still living here in 1905, but a year later William Currell, a teamster had replaced him in the street directory. In 1909 a pipeman, George Skinner was here, and as he was still here in 1911 when the census was held, we know that he was by then aged 44, born in England and listed as a labourer, with his wife Emma who was six years younger, and from Ontario, and their two children, James, 16 and Alice, 14, as well as Emma’s 29-year-old sister, Dorah Keil (actually Dora) and a 12-year-old nephew, Lewis Keil. If the house was cramped, it was because there were two more living here as well, Thomas Bugbee, an American lodger, and also a labourer, and William Currell (still a teamster) who was from Manitoba and George Skinner’s brother-in-law. Both the children had been born in Manitoba, so that was presumably where the family had moved from before heading further west. Dora Keil was a widow; she was born in Winnipeg and was called Dora Crack before she was married Charles Keil. She married again in 1920 to Frank Peacock, four years younger and born in Liverpool. Lewis was her son, actually James Lewis, born in Regina in 1899. At 33 James married Elsie Beale, aged 18, from Galiano Island, although when he died in 1982 he was recorded as being single. A survey of housing was taken in 1962 for the ‘Redevelopment Project’ that was intended to remove the ‘slums’ of the East End – that may well be why there’s an image of the house. It was shown as being in ‘fair’ condition – as were many on this block. Nevertheless, the entire block was bulldozed for a relocated Maclean Park – the earlier version of the park having already been developed with new non-market housing a few years earlier. The park is named after the first Mayor of Vancouver, M A MacLean and was the first park to have a supervised playground in 1911. The Drake has been gone for a few years now; (we took the ‘before’ image in 2010), not noticeably missed in the Downtown Eastside neighbourhood it sat in. Although a fair distance from Chinatown, in its early days it had a close connection. It was built as a four-storey brick store & rooms in 1912 for Kwong Wo Leung, designed by A E Cline and built at a cost of $30,000 by J J Frantz Construction Co., Ltd. Mr. Cline was an architect for many years in the city; his building permits stretch over the first 20 years of the 20th century. Most of his projects were for houses (which he often built as well), and the Drake appears to have been his biggest commission. It wasn’t completed until 1914, when it was called the Manitoba Rooms, replacing the Yuen Wo Co who occupied what was likely to be a modest wooden building here. 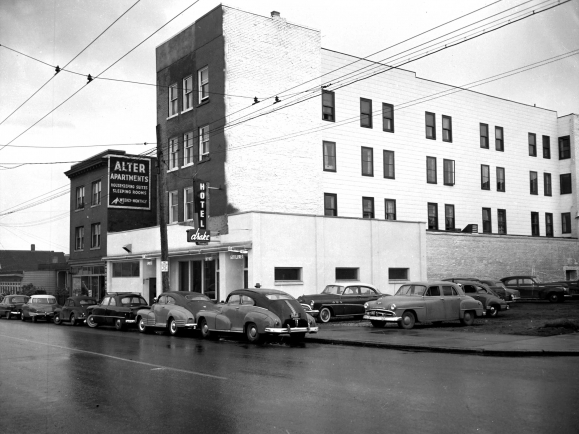 Very confusingly, there were two Manitoba Rooms in the city – a longer established property on East Hastings, and this one, referenced (to distinguish it) as “Manitoba Rooms (Japanese) 606 Powell”. According to Fay Leung’s ‘memoire’ Kwong Wo Leung was a Chinese meat and grocery store that was expropriated for the ‘slum clearance’ of Chinatown that saw McLean Park built in the early 1950s. The Chinese Times from 1950 say they were at 318 E Pender – which is where the China Villa non-market rental building stands, completed in the early 1970s. In earlier times the company were located in the heart of Chinatown, at 5 Canton Alley. It is possible the firm had moved north: it’s not a common name, and a business with the same name was based in Portland in 1882 on Second Street. In 1906 the company donated $3 towards the creation of the Chinese Consolidated Benevolent society in Vancouver. In 1955 the Drake didn’t look dramatically different from 2010, as this Vancouver Province image shows, (although then it had a neighbor to the east). It had been known as the Haddon Hotel (with the Haddon Hotel Beer Parlor in the 1930s) until it had its name changed to the Drake Hotel in the early 1950s. As the Drake it would gain notoriety as one of the stripper bars that proliferated in the early 1970s after the obscenity laws were successfully challenged in BC Provincial courts. By the mid 1970s the Drake was considered one of the better bars to work in, and the managers of the Drake, and the nearby Marr spent $375,000 turning the mill and dockworker bars into ‘Show Lounges’ with state-of-the-art lighting and sound systems. The boom was relatively short-lived; a recession in the early 1980s saw the Drake’s bar receipts fall by over 25% in a year. The neighbourhood didn’t really change: the lounges just became more worn out to match their surroundings. Some of the city’s stripper bars became ‘respectable’, some closed down, and others hung on, but with little investment and fewer patrons. The Drake was bought by the City of Vancouver in 2007 for $3.2m. The ‘last bash’ of the show lounge happened soon afterwards. The site was huge, with a large parking lot. The City briefly renovated the rooms to allow other Downtown Eastside SRO hotels to be decanted and renovated, but a 148 unit social housing project was being planned; the Budzey Building was developed by BC Housing, with the City of Vancouver providing the land. Neale Staniszkis Doll Adams Architects designed the new building; completed in 2015. The Drake’s 1950s neon sign ended up in the Museum of Vancouver collection.